Pleasure Point Park is located on the southern banks of Toledo Bend Reservoir, five miles north of Toledo Bend Dam. Pleasure Point Park’s 195 acres of wooded landscape and three miles of beautiful shoreline have something to offer every member of your family. Whether fishing, swimming, boating, or relaxing by the campfire you’ll see spectacular sunsets and the beauty of the outdoors at Pleasure Point Park. Enjoy our white sandy beach, fishing pier and 2 lane boat launch during your stay at one of our 126 RV sites which are available for daily and monthly rent. 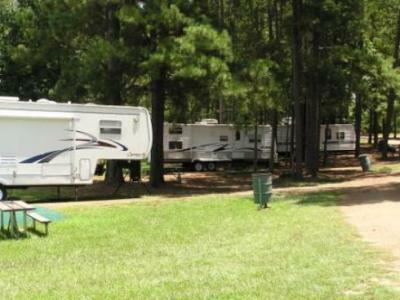 These campsites all have water and 50, 30, 20 amp electric and 50 of the monthly sites offer sewer hook-ups. Well maintained bathhouses, a RV dump station, and a fish cleaning station are also provided for your camping convenience. If getting back to the basics is in your plans, we have a beautiful primitive tent camping area overlooking the lake. We offer one 20 x 20 camping shelter with water and electric that is located adjacent to the beach. If a day is all you have, you may use our boat launch, fishing pier, beach, and picnic area for a day use fee of $2.00 per adult with kids 12 and under free. Pleasure Point Park, a campground where you will leave wanting to come back. Park gate closes (and is locked) at 9:00 PM until 6:00 AM. Special arrangements can be made for late arrivals of registered guests. Pleasure Point Road is 4 miles south of the junction of Louisiana Highway 473 and Louisiana Highway 191. Pleasure Point is just off Louisiana Highway 191. Turn off La 191, between the 5 and 6 mile markers, onto Pleasure Point Road. Go 1.2 miles on Pleasure Point Road to park entrance.